In 2008, I was 16 years old and still trying to figure out who I was. At this age, there’s so much pressure to be or like certain things. Especially for young girls. I feel like at spent my whole life trying to be someone I wasn’t to fit in at school. That’s when I discovered The Maine. I remember stumbling upon them on Myspace like it was yesterday. It may sound silly, but it was really a defining moment in my life. 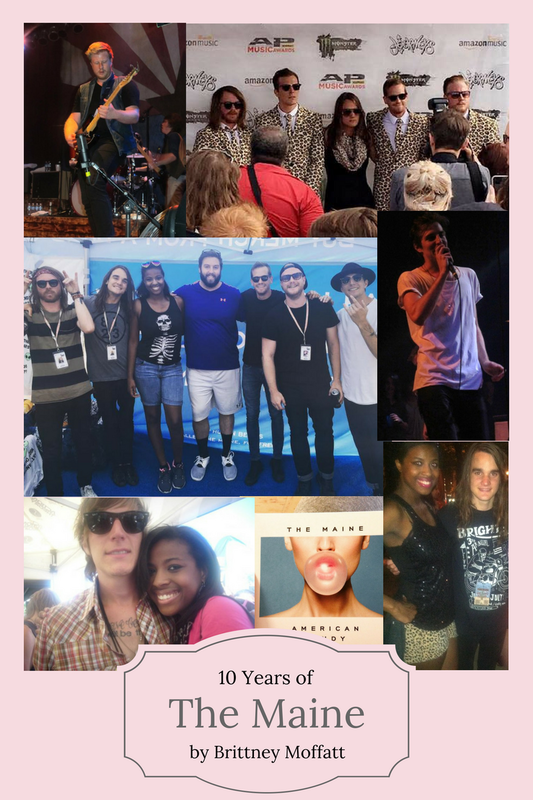 Being a fan of The Maine has lead me to some of my favorite artists, my love of concerts and blogging, and meeting some great people along the way. Essentially, The Maine helped me become the person that I wanted to be. The first time I ever saw The Maine perform was at Warped Tour 2009. Warped Tour is a international tour that features over 50 rock bands every summer. So, naturally I had to research many of the bands and find ones that I liked. The Maine stemmed my love for different kinds of music and I still love it after seven years. My love of concerts also came from The Maine. They weren’t my first concert, but they made the concert experience one I’d never forget. After nearly every show, the Maine would hang out afterward for pictures and autographs. They still make time to meet their fans ten years later! I never had that kind of experience with any other band I enjoyed. Meeting the people who made the music that I loved and inspired so many other positive things in my life is just beyond amazing. Which explains why I can barely speak whenever I meet them! One of my favorite memories from high school was coming home and instantly logging onto Tumblr. Tumblr is a popular blogging site which helped me really discover that I love blogging. I ran a popular Tumblr dedicated to The Maine fans. I’d post pictures, update fans on news, and lead discussions about any topic related to The Maine. We’d even have late night The Maine parties where we would stay up and discuss the craziest things. Just thinking about it now and how those people were more than distant internet friends. Because of The Maine, I had a community where my craziness was embraced and I always had a blast. The Maine’s music has helped me during all kinds of crazy stuff in my life. Their music just makes me feel better no matter what I’m dealing with. Before writing this post, I never thought of how much they’ve impacted my life through their music. So, I’m extremely happy to be preparing to fly to Phoenix to celebrate the Maine being a band for 10 years. Many of those years made my life that much better. Here’s to #8123Fest and more years of The Maine! Be sure to follow for more music posts! APMAS and Warped Tour 2016!